The sour apple martini meets Irish whiskey in this fun and very lively cocktail recipe. The green Dublin apple cocktail is an ideal drink for St. Patrick's Day. Then again, it's also perfect if you simply feel like pouring a little whiskey in your appletini. This recipe is very simple and requires just three ingredients. Making the switch from the vodka used in the average apple martini to Irish whiskey makes a tremendous difference. It adds a depth to the flavor that is impossible to get from the clear liquor. Also, be sure to use white cranberry juice and green sour apple schnapps. This particular combination is responsible for producing the brilliant green color that makes this drink look as great as it tastes. Dip apple slices in lemon juice immediately after cutting them to prevent them from turning yellow. Michael Collins is the suggested Irish whiskey for this cocktail, though production issues in recent years have made it more difficult to find. It's likely that you will need to find a substitute. Almost any Irish whiskey will work perfectly, but Bushmills, Jameson and Kilbeggan would all be excellent options. 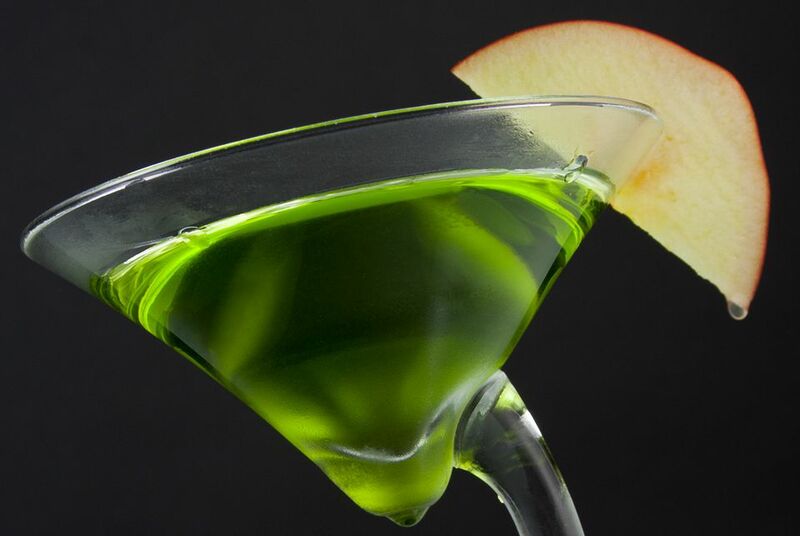 The sour apple schnapps gives this cocktail its beautiful green color and there are a number of options available. While DeKuyper Apple Pucker may be the first brand that comes to mind, try some of the premium brands like Bols, Deauville and Gabriel Boudier. Any of these would be a considerable upgrade and will create a better balance of flavor in the final drink. White cranberry juice is essential for allowing the schnapps to control the drink's color and it has other benefits as well. This clear-colored cranberry juice is not as sweet as the more popular red juice, which is important considering the very sweet taste of apple schnapps. This can be a difficult juice to find in the market, but a good grocer should have at least one option. How Strong Is the Green Dublin Apple Cocktail? The strength of this cocktail is going to depend on your choice of liquors. To give you a general idea, let's assume that your Irish whiskey is 80 proof and the apple schnapps 34 proof. In this case, the finished cocktail would be just around 17 percent alcohol by volume (34 proof). This is relatively mild for martini-style drinks and we can thank the abundance of juice for taming it down a bit.